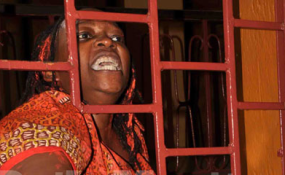 Makerere academic Stella Nyanzi (file photo). Controversial Ugandan scholar and activist Stella Nyanzi has been arrested. According to the Daily Monitor, detectives from the Directorate of Criminal Investigations headquarters pounced on Ms Nyanzi following allegations she abused President Yoweri Museveni and his deceased mother. Nyanzi was arrested at a time she was holding a silent strike at Makerere University in Kampala. She opted for the strike after the institution's management failed to restore her office space despite a court ruling. "We have her and detectives are yet to interrogate her," said DCI Spokesperson Vincent Ssekatte. It is alleged that Nyanzi abused President Museveni and his deceased mother on September 16 on her Facebook page, with Ssekatte describing the offence as cyber harassment and offensive communication. If found guilty, Nyanzi could face a fine of upto UGS480,000 (about Ksh12,000) or a year in jail, or both. This is the second time police are arresting Nyanzi on allegations of abusing President Museveni and his family. In April 2017, Nyanzi was picked from Mackinon Suites Hotel in Kampala where she was speaking to Rotarians about fundraising money for sanitary pads for school girls, and charged with two counts including cyber harassment and offensive communication. She is still battling the charges.